This page is a translated version of the page Wikidata:WikiProject sum of all paintings and the translation is 12% complete. On Wikipedia we have a lot of experience breaking down large amounts of work into smaller chunks that can be completed. Examples of this are the windmill project on the Dutch Wikipedia and the many lists of historic buildings that were created for Wiki Loves Monuments (Q1353202). For paintings we can use the same strategy: We break it down into smaller parts that can be handled and then we can utilize Wikidata to celebrate the sum of all paintings through linked open data! У нас есть много что сделать, пожалуйста, присоединяйтесь к нам! Paintings in scope meet notability guidelines in Wikipedia, as they are notable for being in a notable GLAM (Q1030034) collection, are painted by notable painters, and/or generally have secondary reliable source documentation written about them. GLAM is an acronym and means galleries, libraries, archives and museums, but in a broader sense includes also public buildings like castles, town halls, administrative buildings or religious buildings like churches, cloisters, temples etc. that can hold paintings or wallpaintings and other pieces of art. Use the guidelines of item structure when adding data to each painting entry. Think of it like a collections management database of information. All institutions have metadata of some sort – this data is super important to making the most out of this project. Our dream is that all GLAMs open their collections metadata under a Creative Commons Zero (CC0). This allows us to easily upload data to Wikidata using automated processes and saves us time and people power to focus on other parts of the project. 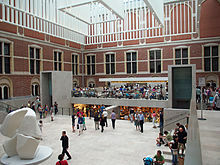 It also means that those GLAMs who have released that data, like the Rijksmuseum (Q190804), already have their data on Wikidata. You can learn more about why you should open your data CC0 here. Right now, only a small group of institutions have done that. But my data is published under a CC-BY-SA license! We can't use it through auto mass import because it is incompatible with the license of Wikidata. It's a restrictive license for data and goes against our mission of providing free, reusable data. For data in databases in the USA we have a similar copyright situation as reproductions of 2D artworks: It's (probably) in the public domain. See the Wikimedia Foundation’s preliminary perspective on the legal issue of database rights. So from a legal standpoint we're probably safe to copy data from a museum in the US, just like we can copy the reproductions of old paintings. Just like with copying reproductions, we'd rather do it together with the GLAM than without their knowledge and consent. See also this overview of cases studies of working together with GLAMs. We haven't released our metadata, but we do have some of our collections online - Great! Then we can slowly work on manually putting your artwork on Wikidata. Please list it below by country and help us by adding your data manually on Wikidata. It's a long process, but better than not having your work represented. Getting the data for all paintings and importing this data and curating the items is a lot of work. To make this manageable we subdivide all paintings in smaller sections by collection (P195). This way people can focus on one collection, get it to a certain standard and then move on to another collection. For this to work every painting needs to have collection (P195). Here are a few ways you can get started in helping out! Wikidata already has quite a few paintings. You can help by adding information to these paintings. Notes: On Wikidata, private collection (Q768717) is a valid collection (P195) and those paintings in private collections should be labelled as such. These will occasionaly have no inventory numbers. You can give it inventory number (P217) with "no value" snak if you are absolutely sure the collection does not use any inventory numbers. Wikimedia commons recognizes "oil on canvas" and "oil on panel" in the artwork "medium" field. On Wikidata, the material used (P186) should be filled with two items; oil paint (Q296955) and also to canvas (Q4259259) or to "panel". The depicts (P180) can refer to specific buildings if a cityscape, or to people, if a portrait, but it can also be something less specific, such as "forest" or "abstract art". Typical genres are landscape art (Q191163) or portrait (Q134307). We also work on things based by country, which is then broken down into institutions within that country. Please add your institutional data here. Just copy and paste from another page if your page is a red link and modify the markup as needed. It's possible to keep notes on individual collections, see the full list of collections here: Wikidata:WikiProject sum of all paintings/Collection. Questions, issues? Just ask on the talk page (click "Discussion") or send out a tweet with the hashtag #glamwiki. You can also use Mix'n'Match to match existing items to these authority control databases. Add the name as the label, add variants as aliases. Catalogs document the paintings that used to be in public collections, were lost to theft or accident, sold for unusually high prices (we can't yet include data about prices paid), or which were notable for some other reason. Old catalogs help trace the provenance of paintings as to owner, attribution or location. You can add items for catalogs and add one catalog number to one painting, or model entire catalogs. The numbers of the artworks used in catalogs is open data. For older paintings, we can just fill these in. For catalogs listed by publisher or institution, see c:Category:Catalogs of art by institutions. Try to find the "recognized" art historian for the specific painter you are studying. If the art historian doesn't exist create an item for him/her, but first check the name using the Dictionary of Art Historians (Q17166797). If you are interested in 17th-century Dutch paintings, please consider helping with the subproject Wikidata:WikiProject sum of all paintings/Hofstede de Groot, which is a compiled list of prominent 17th-century Dutch paintings before World War II split many large European art collections. After importing thousands of paintings, we notice that our data here is not always as clean as it can be. Sometimes creation dates of paintings are missing, attributions are not entirely correct, etc. One way to help cleaning this up, is by focusing on one single painter's work, checking and improving the correctness and completeness of all her/his paintings we already have here on Wikidata. Here's a list of the 100 painters with the most Wikipedia sitelinks and at least 10 paintings on Wikidata. Pick one and indicate you're working on his/her oeuvre! We want to link every painter with it's creator (painter) and improve the quality of the creator items. We create galleries per creator to keep track of them and have an overview of missing creators. The top creators page gives an overview of most important creators based on several different criteria. Chapter volunteers or personnel can help by reaching out to museums to get them to release their metadata for paintings into the public domain (CC0). You might already have existing contacts with museums and this might be the next project to do with them. Because we focus on metadata and not images of artworks we can work together with museums of contemporary art (mostly off-limits for other projects because of copyright restrictions). Over time we'll have case studies here of other museums who contributed to Wikidata and how that worked out. You'll be able to use that as an extra push to get a museum on board. Host events bringing together volunteers to edit painting content on Wikidata. Talk to your staff about opening up your metadata under a CC0 license. Then get in touch with us on the talk page or via Twitter hashtag #glamwiki and tell us that you've opened it. We'll work with you to make sure it's properly declared and accessible and then start the processing of uploading your data to Wikidata! Learn more here. Have events to support adding painting data to Wikidata manually and painting content onto Wikipedia! The Sum of All Titles: If a collection is located in a non-English speaking country, then chances are that we don't have proper native titles for many paintings in the collection. If you can give us a list of titles per painter in your collection indexed by inventory number, we can add that information to existing items in Wikidata. The Sum of All Portraits: For important portrait painters, often the sitter is unknown on Wikipedia. If you have identified sitters in portraits in your collection, or if you know whether a portrait was made based on a photograph or sculpture or some other pre-existing work, let us know! To import datasets to Wikidata we need bot operators. The current import bots are all based on Pywikibot so some knowledge of that or of Python is a pro. It's also quite important you understand the dataset, not everything is in English! We found several nice CC0 licensed collections that can be imported now by a bot. The todo list of things still to add to this page, feel free to expand!